President Obama made his first visit to our most valuable ally and the only democracy in the Middle East, Israel, for the first time. 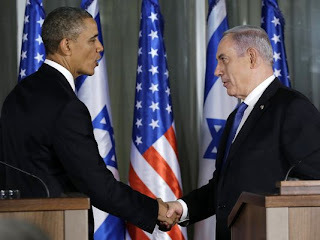 He previously said, early into his first term, that he didn't want to visit Israel unless he had something concrete to contribute to the peace process, and yet he found plenty of excuses for visiting the Middle East during his first term as part of his infamous "World Apology Tour" (remember the photos and video of Obama, as the US President, bowing to the Saudi King?). Israeli Prime Minister, Benjamin "Bibi" Netanyahu paid a couple of visits to Washington during the first term (he was deliberately snubbed on one occasion by Obama), and it's no secret that Obama and Bibi aren't especially fond of each other, particularly given Obama's none to subtle pro-Arab stance on various issues such as the creation of an independent Palestinian state, support of the militant Muslim Brotherhood, and increased military aid to various Arab states (including Egypt and the rebels in Syria which also include elements of Al-Qaida and other terrorist groups). Of course, there's a great deal of contention regarding expansion of Israeli settlements into Palestinian areas which the Israelis consider essential to creating a buffer zone while Palestinians consider it an illegal seizure of land that they are powerless to stop as well as well the blockade of Gaza and dispute over Jerusalem as the capital of Israel. Meanwhile, groups like Hezbollah and Hamas continuing to load up on long range missiles, RPGs, rockets, mortars, mines and other weapons through their sponsor, Iran, which are being smuggled in through Egypt and Syria, and various ports in Lebanon. And, of course, Iran is working feverishly toward the creation of a nuclear bomb under the auspices of developing a new energy source. The result is an Israel surrounded by potential devastation aimed at nearly point blank range and a potential nuclear "Sword of Damocles" hanging over their head. So, this week Obama travelled to Israel with a pledge of "trust me" and "we stand with Israel", which has been followed up by new Secretary of State John Kerry (the same Kerry of "Swiftboat" notoriety who, as a Vietnam veteran, threw his medals away and turned his back on fellow veterans). Well, Obama didn't have any contributions to make to the peace process. He did get an opportunity to speak with some handpicked Left leaning Israeli youth and urged them to reject the policies of Netanyahu Administration, including the development of an "Iron Shield", similar to our own, to protect Israel from incoming missiles. Geez, with a friend like that, who needs enemies? Personally, if I were in the place of the average Israeli, I would be quietly buying a few more clips for my Uzi and digging a new shelter just a bit deeper. In my opinion, Israel should maintain a healthy skepticism of Obama's commitment to "stand by Israel". He has not proven to be especially trustworthy when it's come to protecting American interest at home. I see no reason to expect that he'll follow through with any hard and fast action on Israel's behalf should things escalate. Sure, the World can expect more talk; more words of caution; more empty threats; and more warnings (it's like stomping your foot and "counting to three" when you have a misbehaving child who's throwing a temper tantrum when they probably need an old fashioned spanking). But Israelis ultimately have to ask themselves, would this President actually commit ground troops and heavy military hardware to protect Israel? Somehow, I don't think so. He'll hesitate when decisive action is required, and for Israel, that could be fatal. I can't, and won't put all the blame on Obama, Kerry, those idealistic but naive Israeli college students, or even the legendary Israeli President, Shimon Perez, who publicly stated that be believed Obama's commitment to Israeli security. When your back is up against the wall, one tends to believe twigs are vines. Jews have historically suffered because of misplaced trust. Yes, they do have loyal friends (especially here in America) who will stand by them come hell or high water, but they have to approach the world as it is and with their eyes wide open. Here in America, the Jewish Community by and large blindly places its full trust behind the Democratic Party. Why? Since Israel's founding in 1948, it's traditionally been the Republicans and conservatives who have come to Israel's defense. Yes, the Democratic Party aligns with most Jews (and average America's) sense of tolerance when it comes to social issues, and frankly, the right wing religious zealots are pretty damn scary. But on fiscal issues, the GOP comes closest to matching the ideals of most Jews (and, again, average America's), and on the issue of support for Israel, conservatives have this hands down. Now, I'm not saying "don't vote for Democrats". Not at all. I'm saying don't give your votes away. Don't "assume" that because the Democratic Party and you agree on the localized social issue that maybe...just maybe...they'll take care of Israel too or somehow the Republicans that you ignored but won anyway will be able to step in and minimize any anti-Israel policies (and no, the so-called "Jewish Lobby", as powerful as it is, is still no guarantee of protection). What I am saying is that Jews in America may have to make a choice of looking beyond a few social issues and Israel's survival. Finally, there has to be and must be an end to the violence in the Middle East. Jews, Muslims, and Christians are all the Children of Abraham. They are one Family. Why, then, do they try to destroy each other? It's madness in its truest form. Israel has a right to exist and it isn't going anywhere, but the Palestinians also have the right to exist as equals, and they aren't going anywhere either. Now, whether this is within Israel proper or in their own homeland is a matter of negotiation. After being denied a homeland for over two thousand years, I would have expected Israel, of all people, to feel the greatest sympathy for the Palestinians and work to help them create a homeland of their own. As for the rest of the Arab World, it's really not their business, except to create an environment for peace and cooperation between Israel and the Palestinian People. When you have a disagreement between two neighbors, it's not a matter for the whole neighborhood. It's the nobler man who brings peace instead of war.